For the last 25 years, Gerardo Alessandrini has paid homage to the Great American Musical in the best way he knows how, by skewering it relentlessly. It is an arena where nothing is off limits - no diva, no composer, and no quirk of the genre, which is why his Forbidden Broadway revues are as beloved as any book musical to grace the Great White Way. Musical lovers love their musicals, but they’re also quick to tell you what they hate. And what they hate, they love to make fun of. Therein lies the secret to Alessandrini’s success. For every fan of Les Mis who longs for the return of the turntable, there is another who secretly hopes the whole overblown affair will finally die in the wings. 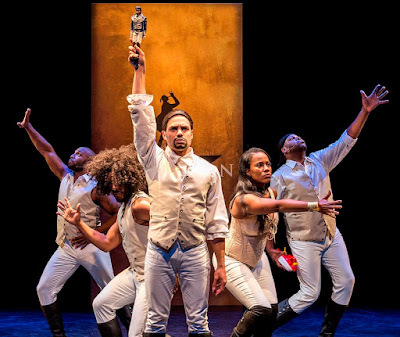 Now, the biggest game-changer since Rodgers and Hammerstein, Andrew Lloyd Webber, or Stephen Sondheim came on the scene, has given him fodder for a new installment in his popular franchise - Lin-Manuel Miranda and his multi-Tony Award-winning mega-hit, Hamilton: An American Musical. 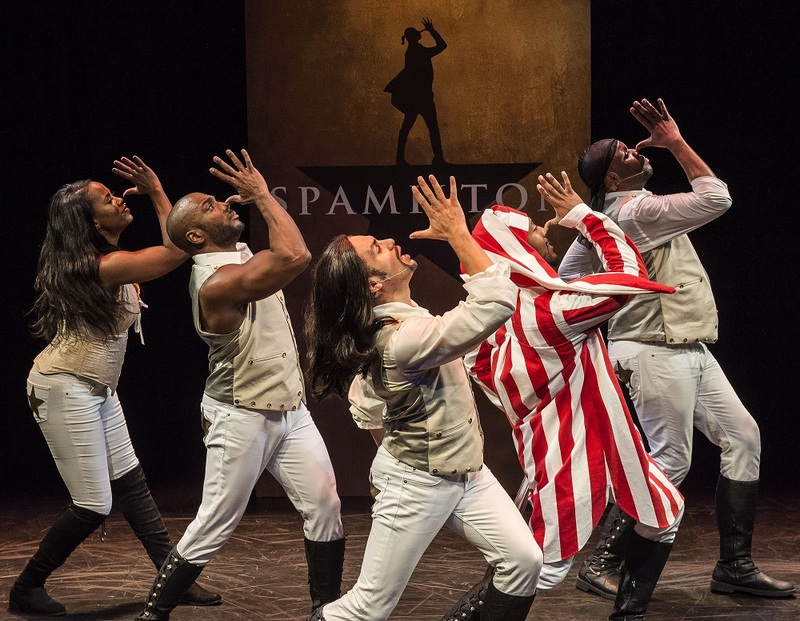 Reinvented as Spamilton: An American Parody, Alessandrini takes a giant leap forward in the way he spoofs Hamilton’s entire epic saga. The result is a buoyant thrill ride of hilarity that never lets up. In a happy coincidence, both productions are currently running in LA, one in Culver City and the other in Hollywood. I happened to see them both for the first time within a week of each other, which only made it more obvious how remarkable each is in its own right. Without a doubt, Hamilton is the wave of the future, representing a Broadway that is inclusive, forward thinking, open to reinterpretation, and rich in musical forms that draw as much from popular styles as they do traditional ones. It is a masterful work, monumentally important at every level. The story, ripped from the pages of American history and told by a multiculturally diverse cast using hip-hop as its basis, was unlike anything Broadway had ever seen or knew it wanted (although In the Heights already proved Miranda was on to something). It’s no wonder it took over the musical theatre world like a speeding train. 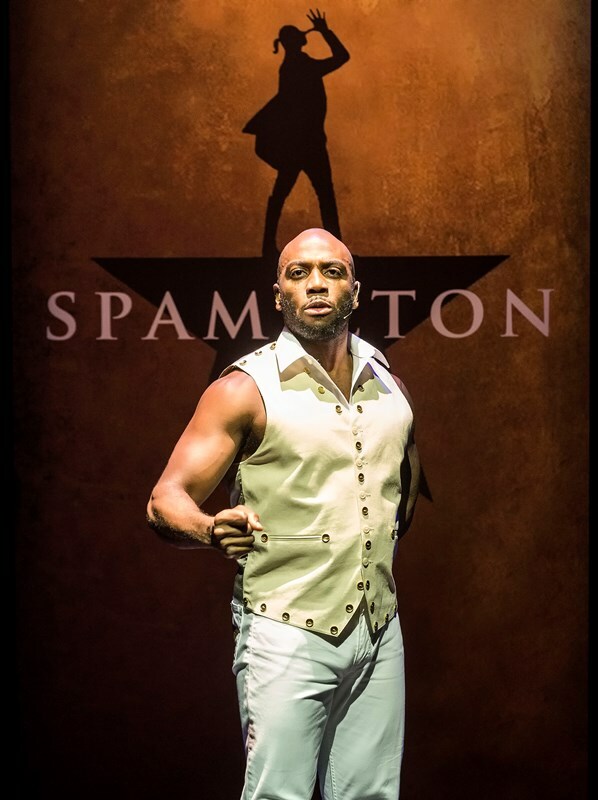 Both Hamilton and Spamilton are written to entertain, and both are smart, complex, and exciting works. 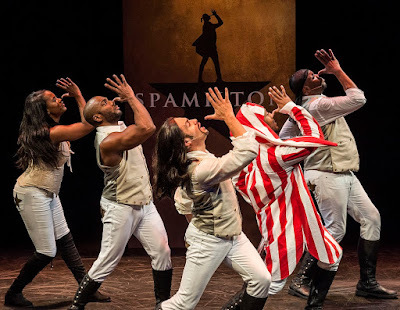 But where Hamilton reinvents the genre itself and opens up conversations of many kinds, Spamilton’s goal is much simpler. 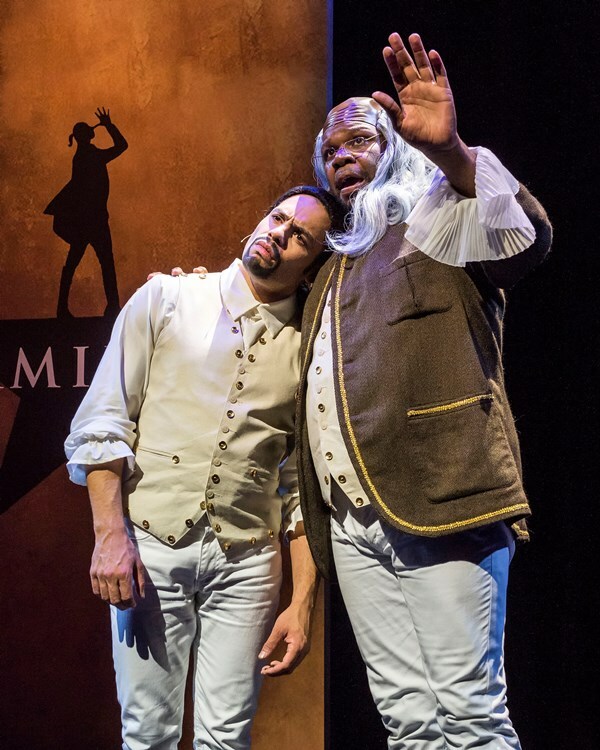 Its singular reason for existing is to make you laugh, and because it sees everything about the Hamilton phenomenon as fair game, it takes its jabs wherever it pleases. Charismatic William Cooper Howell nails Miranda’s style and attitude with a knowing smile that never lets us forget he isn’t taking anything too seriously. 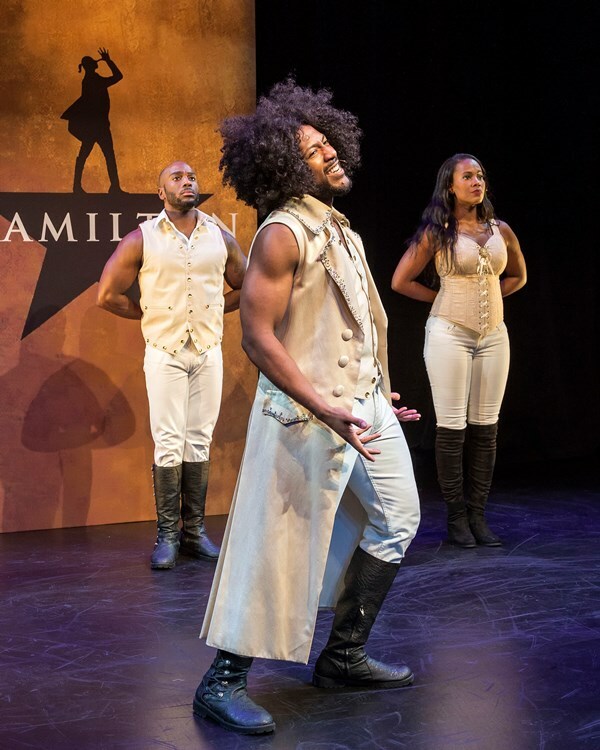 That’s Wilkie Ferguson III’s role, channeling (beautifully) original cast member Leslie Odom Jr.’s intensity and competitive spirit as Aaron Burr. John Devereaux, in the Daveed Diggs roles of Thomas Jefferson and the Marquis de Lafayette, turns the crowd-pleasing “What Did I Miss” into a bouncy “What Did You Miss,” poking fun at how fast Miranda’s lyrics go by. He also goes old school rap in a mash-up of “Guns and Ships” and Will Smith’s Fresh Prince of Bel Air theme song, now rewritten as “The Fresh Prince of Big Hair.” You get the idea. 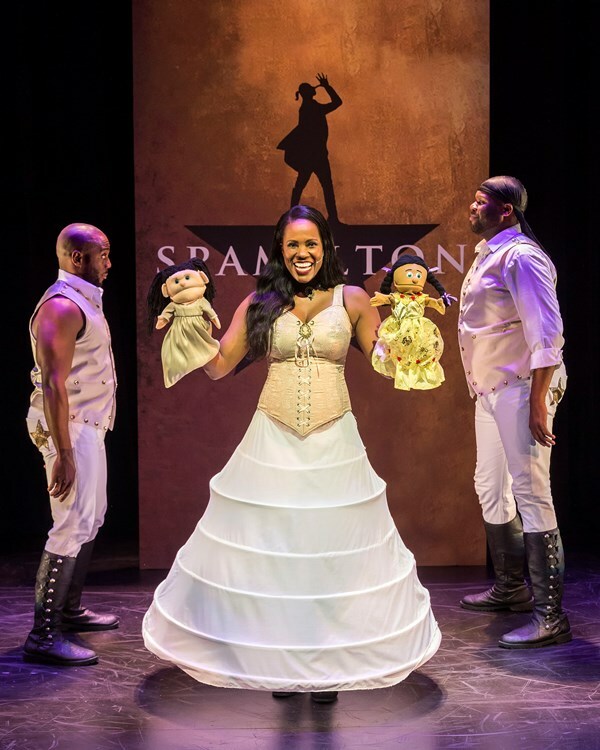 Zakiya Young handles all three Schuyler sisters as originally played by Phillipa Soo, Renée Elise Goldsberry, and Jasmine Cephas Jones, with the help of two Avenue Q-style puppets. Young has an impressive ability to change her vocal sound to match whichever character she is channeling, including heavy hitters like Audra McDonald and J-Lo, who also make appearances in the show. Miranda writes the personality of each sister into the way she sings her own name in Hamilton and it is particularly fun to hear how Young interprets those differences. 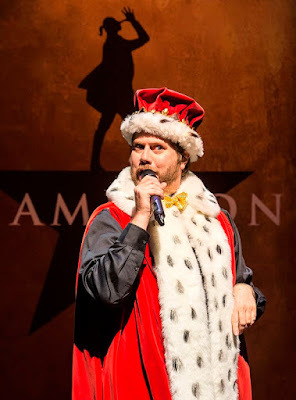 Glenn Bassett returns to play wacky King George, the role he originated Off-Broadway in a twist that finds the character pouting over the lack of gays on Broadway now that Hamilton has straightened things up. 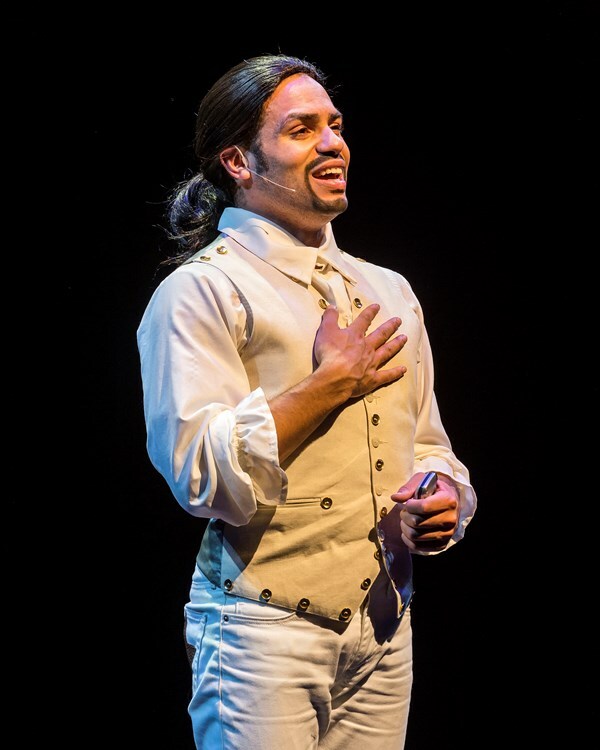 During the song, he invites the audience to sing a chorus along with him consisting of a single word, “gay, gay, gay, gay gay” and the absurdity of that moment brings home Alessandrino’s ability to cut right to the heart of the zinger. The Sondheim section gives Dedrick A. Bonner the spotlight as a Yoda-Ben Franklin who counsels Howell with wise words from Into the Woods, and later on, as the single biggest sight gag in the show. 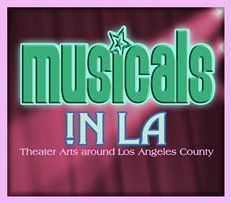 It is an automatic hold for laughs and traditional musical lovers will eat it up when they see it. In addition to the Hamilton parodies, the show also pays tribute to a host of other musical theatre gems in rapid-fire mentions. The King and I, Sunset Boulevard, Wicked, Gypsy, Assassins, Aladdin, and West Side Story are only a few of the many slipped in that speed by so quickly you’ll need to pay attention or you’ll miss them. 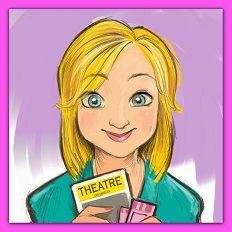 The Beggar Woman (Susanne Blakeslee) from Sweeney Todd gets a running gag based on the high cost of Hamilton tickets but it is one of the few jokes that doesn’t gather much steam. Appearances by Liza Minelli and Barbra Streisand, though expertly recreated by Blakeslee, also don’t organically fit this new incarnation of parody musical as they have in past Forbidden Broadways. Here they feel more like filler and the show just doesn’t need it. Alessandrino’s stripped-down staging and Gerry McIntyre’s shorthand version of the original choreography is delivered with precision and boundless energy by the ensemble. Diction, specifics, timing...it’s all there. Musical director James Lent, at the piano, has polished this dime store dream until it shines like Tiffany glass. A central Spamilton show card serves as the lone backdrop to disguise the vast number of goofy props, eccentric characters, and other surprises that will emerge throughout the performance. 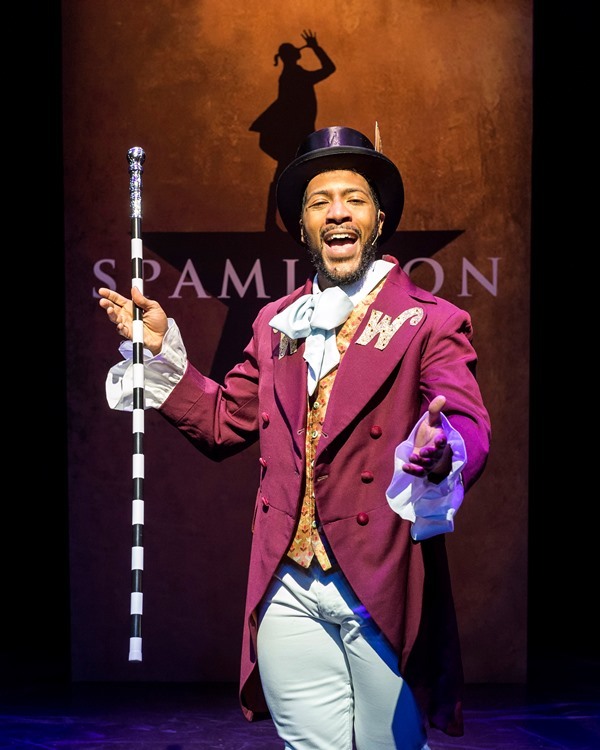 Spamilton was tailor-made for the trivial pursuit-inclined musical theatre lover and for Hamilton fans who can’t get enough. If you fit into either of these categories, this is your show. If you don’t, the cast is so likeable and entertaining you won’t even care if you miss a few jokes. It’s a roller coaster ride with a ticket you can afford and a guaranteed good time to go with it. I couldn’t get enough.